Over the years some of the guys that I’ve worked with have mentioned that they occasionally take home boneless chuck steaks. Why? Here we are surrounded by steaks of every kind, all day, and they take home a boneless chuck steak! I have to admit that I’ve been somewhat of a meat snob. I have tried just about every little cut of beef there is to see what hidden qualities that they may have except for the chuck steak. I’ve considered the chuck steak to be a tough steak good for swissing and that’s about it, unless you marinate it in something that would break down the fibers, like say battery acid for a week. You know what? I was wrong. I know, I’m having a tough time believing it myself. 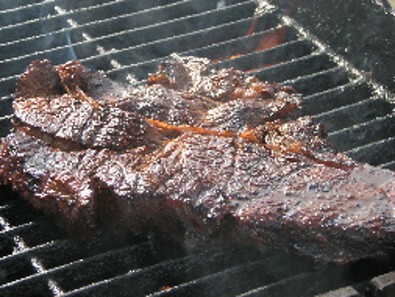 How could I after over thirty years in the meat biz not know about boneless chuck steak’s grilling qualities? The truth is I didn’t know until this Sunday when I fired up the grill and slapped a couple of big slabs of boneless chuck steaks onto it. Now I’m a believer. Saturday I hand selected two nice big boneless chuck steaks from work and took them home where I placed them in a special sealed container with a generous amount of my special marinade that I just invented. After church the next day I placed them on my grill on low to medium heat and cooked them for about ten minutes on each side. They were delicious. The kids loved them. Well, except for Bethy, my 16 year old that has a somewhat discerning palate just like her mom, who uses the fillet I got her one Mother’s Day as some kind of standard. But they were good If you don’t mind chewing a little bit. The flavor was great and they were tender enough, especially considering that they were only $1.99 a pound. That’s fourteen dollars a pound cheaper than a fillet. For that kind of savings I don’t mind having to chew before I swallow. Anyhow we all pitched in. I took care of the beef steaks. Jessica and Josh made potato rolls (outstanding). Vickie made a nice tossed salad and some cooked squash, green beans, carrots and onion mixture that was really good and Ariel cooked and smashed up some nice potatoes with lots of butter and undiluted canned milk that was so good we didn’t even miss the gravy, and watermelon for desert. An outstanding meal. I asked everyone later to rate the chuck steaks on a scale of one to ten. Everyone one of them except for Bethy and her mom graded them an eight or better. Not bad and the boneless chuck steaks only put me back $6.65 to feed all ten of us. Mix all ingredients together and place one large (1/2 to 2 pound) boneless chuck steak in the mixture and refrigerate overnight making sure meat is submerged in mixture. Grill on medium to low heat for about ten minutes each side. Cook a little less for medium rare and of course a little more for well done. Warning: This marinade is quite tasty and may not be suitable for all. It might be a little salty for some. Back off on the soy sauce if you have concerns.